I’m on the road again visiting universities, attending select conferences and forums and speaking to groups of all kinds. If you would like me to visit your university and your accounting/audit program, please write soon to lock in upcoming dates. Contact me at fmckenna@marketwatch.com to schedule a presentation at your university, conference, or firm. April 10, 2019, San Francisco, CA, ,“Future of Financial Fraud II” conference presented by UC-Berkeley’s law school, partnering w/Pacific Square Research and some of the biggest names in fraud writing and investing including Bethany McLean, Herb Greenberg, Jim Chanos of Kynikos, Diana Henriques, John Carreyrou and Alex Gibney with a special showing of the new HBO documentary about the Theranos fraud, Linnette Lopez of Business Insider, Carson Block of Muddy Waters Research, and ME! April 15, 2019, A special lunch workshop on April 15 in Chicago for the Journalists in Residence at the Stigler Center, University of Chicago Booth School of Business. I will be talking about reporting on corporate fraud as a subject matter expert and former accountant/auditor. 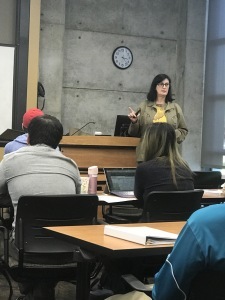 April 3, 2019, Talking to MAcc students at Texas A&M University at the invitation of Professor Michael Shaub. He teaches Accounting and Ethics. This is my third time with them. Via Skype. March 13, 2019, Ohio State Fisher College of Business Masters in Accounting Program trip to Washington D.C., sponsored by Professor Zach Tzachi, includes a visit to the MarketWatch/WSJ newsroom to hear me speak from 5-7 p.m. Staff from The Washington Campus, a non-profit, non-partisan, higher education consortium that includes some of the world’s leading business schools, will also attend. March 24-25, 2019, I was asked again, for the eighth year, to be a preliminary judge for the Gerald Loeb Awards for Distinguished Business and Financial Journalism. ( I am a two-time award finalist.) UCLA, Los Angeles, CA. March 26, 2019, Columbia University Graduate School of Journalism Knight-Bagehot Fellowship brings 10 mid-career career business journalists from newsrooms around the world to spend a year at Columbia taking a full course load at the Business and Journalism Schools. Raju Narisetti, Professor, Professional Practice and Program Director has asked me to present a “Tuesday Evening Seminar” where seasoned reporters/writers/editors talk in depth about their work/beat and how they do what they do well. I’ll do a Seminar for the KB Fellows on reporting on corporate fraud as a subject matter expert and former accountant/auditor. March 5, 2019, Indiana University and Purdue University Masters in Accounting Programs trip to Washington D.C. 4:30-5:30 at the headquarters of the American Institute of CPAs, in the Willard Office building, 1455 Pennsylvania Ave., NW, under the auspices of The Washington Campus. February 12, 2019, I was on @YahooFinance earlier this week talking Schumer/Sanders/Rubio stock buyback ban proposals using words like gutless and silly and litmus test. My recent MarketWatch story about Senators Schumer’s and Sanders’ NY Times OpEd on restricting share buybacks is here. January 25, 2019, Gerald Loeb Awards Twitter Chat, Hashtag #LoebAwards, 11:00 a.m. EST. I will be talking on Twitter with Jonathan Daillak, the Executive Director of The G and R Loeb Foundation and The Gerald Loeb Awards for UCLA Anderson about my experience as a finalist and preliminary judge for the Gerald Loeb Award for Distinguished Business Journalism. The 2019 #LoebAwards Call for Entries is now open. January 17-19, 2019, American Accounting Association 2019 Auditing Section Midyear Meeting, Nashville, TN. Attending as AAA member and academic. If you are attending and want to talk about your research please write me at fmckenna@marketwatch.com. 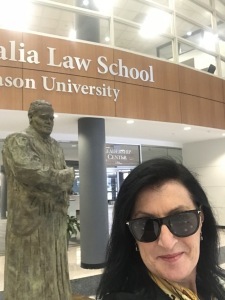 January 8th, 2019, Antonin Scalia Law School at George Mason University, at the invitation of Jordan Neyland, Assistant Professor of Law at the Antonin Scalia Law School at George Mason University. 12pm to 2pm class to talk about accounting and financial statements concepts for law students and recent litigation against the Big 4 auditors. November 26, 2018, Marquette University, fourth time speaking to graduate auditing class at the invitation of Accounting Department Chairman Michael Akers. November 7, 2018, I returned to The Ohio State University Fisher School of Business, for the fall MAcc Speaker Series, 12-12:50pm main presentation and a second presentation for undergraduates, then informal conversations with faculty and PhD students throughout the day. Hosted by department chair and MIS professor Brian Mittendorf. November 1, 2018, Securities Enforcement Forum 2018, Four Seasons Hotel, Washington DC. Attended as media. October 26, 2018, California Society of CPAs Accounting and Auditing Conference, October 25-26, 2018 at the Sheraton Universal Hotel, Universal City, CA. Speaker on “Fraud Happens: Case Studies In Auditor Liability” from 1:55pm-2:45pm on Friday. October 24, 2018, Loyola Marymount University, spoke to undergraduate and graduate students in accounting ethics classes by invitation from department chair Professor Larry Kalbers and Professor Scott Delanty. Speaking at Loyola Marymount University, Los Angeles CA. 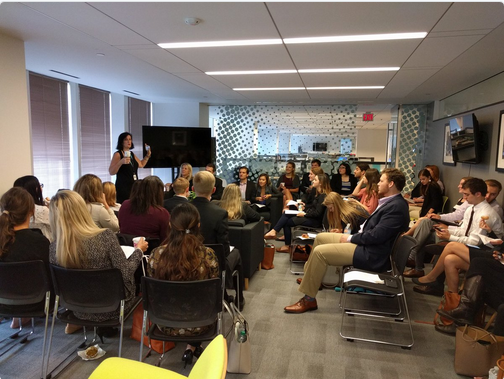 October 16, 2018, Back for the third year in a row, the Baylor University Masters in Accounting program visited the MarketWatch/WSJ DC newsroom to hear from me about the latest accounting and audit stories in the news. Hosted by Professors Gia Chevis who teaches accounting ethics. October 9, 2018, Grant’s Interest Rate Observer, 35th Anniversary Conference in New York at the Plaza Hotel. After many years of good relations and a recent podcast performance, Jim Grant asked me to present at his conference this fall. From Jim Grant: “I deem it essential that someone—no, not just someone, but you—speak on the theme of willful self-delusion through accounting (have been thinking about this since your terrific podcast appearance). This would entail a short survey of the evolution from GAAP to (increasingly) non-GAAP methods followed by a discussion of, say, three specific instances of accounting abuse that directly bear on securities prices. You would have 40 minutes, including Q&A. It would be a privilege and a pleasure to have you on the program.” The presentation can be found here . September 25, 2018, Via Skype to Journalism 101 – Reporting and Writing on Business and Economics at Texas A&M, at the invitation of Hannele Rubin, an Instructional Assistant Professor in the Journalism Studies Program. September 17, 2018, In commemoration of the 10th anniversary of the Lehman Brothers bankruptcy on September 15, 2008, I was a guest on the NPR news show Here and Now to talk with host Peter O’Dowd about the tricky financial instruments used during the financial crisis and if they’re still a risk. #repo105 #cds #cdo #mbs #rtm The show airs at 2pm EST on DC’s WAMU 88.5 FM and in Chicago on WBEZ 91.5 between 1-3 CST. Here’s a link to the segment. September 11, 2018, Moderator for the Congressional Hispanic Caucus Institute 2018 Leadership Conference in Washington DC. Topic was blockchain and the panel will include Justin Slaughter, a partner at Mercury Strategies and formerly Chief Policy Adviser and Special Counsel to Commodity Futures Trading Commissioner Sharon Y. Bowen. May 3, 2018, Baruch College’s 17th Annual Financial Reporting Conference. New York, NY. I attended as media. May 2, 2018, A first ever corporate fraud and forensic accounting conference dubbed “The Future of Fraud” Presented by UC-Berkeley’s law school, partnering w/Pacific Square Research and some of the biggest names in fraud writing and investing including Bethany McLean, Herb Greenberg, Jim Chanos and Kynikos, Kirkland & Ellis, Carson Block of Muddy Waters Research, and ME! New York City. Here are the details. April 11, 2018, Talking to MAcc students at Texas A&M University at the invitation of Professor Michael Shaub. He teaches Accounting and Ethics. This is my second time with them. Via Skype. March 25-26, 2014, I was asked again, for the seventh year, to be a preliminary judge (this time for the Commentary entries) for the Gerald Loeb Awards for Distinguished Business and Financial Journalism. ( I am a two-time award finalist.) UCLA, Los Angeles, CA. March 8, 2018, Columbia University Business School 3rd Annual News and Finance Conference. I was on a journalist panel moderated by Charles Calomiris of Columbia U. with with Shannon Bond from the FT, Sarah Kopit of Bloomberg and Chris Wiggins of the New York Times. The theme is “Fake News.” Organized by the News and Finance Initiative of Columbia Business School’s Program for Financial Studies and its faculty directors Paul Glasserman, Harry Mamaysky, and Paul Tetlock. Go here for more info. February 8, 2018, The Ohio State University Fisher School of Business, MAcc Speaker Series, Thursday February 8, 12-12:50pm main presentation and then informal conversations with faculty and PhD students throughout the day. Hosted by department chair and MIS professor Brian Mittendorf. The presentation can be found here. November 28, 2017, The Neel Corporate Governance Center at the University of Tennessee, Distinguished Speaker Series. I met individually with active faculty and PhD students doing research and then give a 1.5 hour presentation for attendees from the accounting, finance, and law departments, including Master’s of Accounting students. November 30, 2017, Marquette University third time speaking to graduate auditing class at the invitation to Accounting Department Chairman Michael Akers. October 9, 2017, Back for the second year in a row, the Baylor University Masters in Accounting program visited the MarketWatch/WSJ DC newsroom and hear from me about the latest accounting and audit stories in the news. Hosted by Professors Gia Chevis who teaches ethics and Tim Thomasson who teaches tax. June 6, 2017, National Investor Relations Institute National Conference, Orlando FL. I will be a panelist with Business Wire and two others taking a deep look at today’s earnings and financial reporting landscape and outline ways IROs can reduce time and risk while adhering to earnings release best practices. Included in this candid conversation will be an overview of the regulatory environment as it relates to earnings releases and the post-dissemination landscape. The panel invitation came out our efforts at MarketWatch in the last year to focus on non-GAAP earnings issues. November 26, 2016, Guest lecturer to graduate accounting students at Benedictine University, Lisle, IL at the invitation of Martin Terpstra, M.S., C.P.A., Plante & Moran LLP partner and adjunct instructor of audit and forensic accounting. November 17, 2016, Duquesne University Accounting Department Fifth Annual Accounting CPE Conference. I spoke about accountning and auditors in the news. November 7, 2016, NYU Stern School, New York, New York, Panelist for “Recent Trends in Non-GAAP Reporting”, 4-8 pm. My remarks are here. October 21, 2016, Visit in Marketwatch/WSJ DC newsroom from the Baylor University Masters in Accounting program. Yes, all 36 students and two faculty, Gia Chevis who teaches ethics and Tim Thomasson who teaches tax, were there. Click here to see our agenda. October 13, 2016, Securities Enforcement Forum 2014, Mayflower Hotel, Washington DC. Attended as media. Asked questions. October 13, 2016, FCPA Compliance Report-Episode 285 Interviews Francine McKenna, In this episode my old friend Tom Fox interviews me for his podcast on the recently concluded Taylor Bean litigation against PwC and what it might mean for the Big 3 going forward. September 20, 2016, Washington DC, 7A.M. I was on a panel with Daliah Saper, Principal Saper Law, and Brian Stafford CEO Diligent Corp for a Power Breakfast: Communicating in Critical Times at the National Association of Corporate Directors 2016 Global Board Leaders’ Summit. “A leaked e-mail, an overlooked disclosure, or just a simple misunderstanding can cost a company billions of dollars. Boards must balance demands for transparency from activist shareholders, workers’ rights groups, and governments with the need to protect trade secrets and board negotiations. This session exposes the potential pitfalls of being uninformed and explores how boards can best receive critical information from management, meet their fiduciary responsibilities, and reduce their liability. August 22, 2016, I was interviewed for Late Night Live, an Australian radio show on the Australian Broadcasting Company network about Trump’s taxes and the PwC-TBW trial. August 8, 2016, Keiser Report, cable TV appearance in Washington DC with Max Keiser. Watch Part 1 and Part II where I talk about Donald Trump’s taxes, the banks, and PwC’s trial defending its audit at Colonial Bank, a crisis era failure along with Taylor Bean & Whitaker that was all about massive multi-year fraud the auditors did not detect. My interviews start in each case at the 12:45 mark. July 1, 2016, On a panel at the Financial Times Camp Alphaville Festival of Finance, London England. I spoke about spotting corporate fraud with Carson Block of Muddy Waters Research on a panel moderated by the FT’s Dan McCrum. March 20-21, 2016, I was asked again, my 6th year, to be a preliminary judge for the Gerald Loeb Awards for Distinguished Business and Financial Journalism. ( I am a two-time award finalist.) UCLA, Los Angeles, CA. July 15, 2015, Spoke with Broc Romanek, editor of the CorporateCounsel.net, to the Shareholder Services Association Annual Meeting on “Leveraging Social Media.” Mayflower Hotel, Washington, D.C..
November 4, 2015, Attended as media. 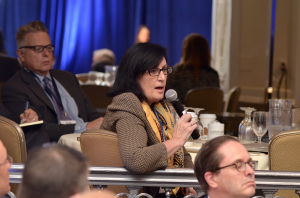 Securities Enforcement Forum 2015, Mayflower Hotel, Washington DC. May 5-6, 2015, Attended as media. Finance and Society Conference, sponsored by The Institute For New Economic Thinking, Washington DC. Private dinner with Elizabeth Warren on May 5 and full-day invitation-only conference on May 6th including speakers Janet Yellen, Christine Lagarde, Brooksley Born and Anat Admati. For more information you can view the program here. May 5, 2015, Attended as media. “The Auditor of the Future”, a conference sponsored by the Center for Audit Quality, the John L. Weinberg Center for Corporate Governance and the Department of Accounting and MIS, Lerner College of Business & Economics, University of Delaware. 9:30 a.m.–12:00 p.m. Gore Recital Hall, University of Delaware. To register go here. May 2, 2015, Guest lecturer. Baruch College/CUNY, Zicklin School of Business, New York, NY, for an advanced auditing class at the invitation of Professor Doug Carmichael. March 25, 2015, Roosevelt University, Chicago, IL. Accounting Club presentation. “The Future of Public Accounting: What Does That Mean For Students”. March 23-24, 2015, I was asked again, my 5th year, to be a preliminary judge for the Gerald Loeb Awards for Distinguished Business and Financial Journalism. ( I am a two-time award finalist.) UCLA, Los Angeles, CA. February 18, 2015, Stanford University and the Graduate School of Business. Visiting lecturer for undergraduate and graduate classes taught by Professor Anat Admati, author of the book Bankers’ New Clothes. December 3-4, 2014, Illinois CPA Society’s 2014 Accounting & Auditing Conference, Wednesday, December 3, 2014 at The Crowne Plaza Hotel, Springfield, IL, and also on Thursday, December 4, 2014 at the Donald E. Stephens Convention Center, Rosemont, IL. I will present at both locations with Martin W. Terpstra, CPA, CFE, Partner, Forensic & Valuation Services, Plante & Moran PLLC, “Lessons from Litigation – CSI”. Here’s my presentation. October 14, 2014, Securities Enforcement Forum 2014, Four Seasons Hotel, Washington DC. Attended as media. October 12-14, 2014, NACD Board Leadership Conference: Beyond Borders, Gaylord National Resort | National Harbor, Maryland. Attended as media. October 11, 2014, University of Illinois-Chicago, ‘ProfessionaPalooza’ 2014 Conference, Speaking at 10 am on “Opportunities in Professional Services for Business Undergraduates – Audit, Consulting and Risk/Compliance.” The presentation is here. July 10-12, 2014, Society for the Advancement of Socio-Economics Conference. Theme of this year conference is “The Institutional Foundation of Capitalism”. Our special session is entitled ‘The New Financial Architecture after Financial Crisis’. I’ll be a panelist with moderator Guler Aras, Ph.D. and Professor of Finance & Accounting and Visiting Scholar of Finance at the McDonough School of Business and Center for Financial Markets and Policy at Georgetown University, Thomas Clarke, Professor of Management and Director of the Key University Research Centre for Corporate Governance at the University of Technology, Sydney, Shyam Sunder, James L. Frank Professor of Accounting, Economics, and Finance at the Yale School of Management; Professor in the Department of Economics; and Fellow of the Whitney Humanities Center, and Paul William, Professor, Ernst & Young Faculty Research Fellow, at NC State University. Williams is also Associate Editor for Critical Perspectives on Accounting. The conference is organized by Northwestern University and the University of Chicago and will be held in Chicago. Text of speech can be found here. April 29, 2014, Speaking to accounting students at Benedictine University, Lisle, IL at the invitation of Martin Terpstra, M.S., C.P.A., Plante & Moran LLP partner and adjunct instructor of audit and forensic accounting. April 24 and 25, 2014, Speaking at the 2014 Williamsburg Fraud Conference, Norfolk VA. Jointly sponsored by the Tidewater Chapter of the IIA and The Hampton Roads Chapter of the ACFE. Luncheon keynote speech is here. April 23, 2014, Speaking at Hampton Roads Economic Club, Norfolk VA, noon meeting. My luncheon keynote speech is here. April 7, 2014, IIA Annual Conference, Chicago Chapter, Rosemont, Illinois, Joint presentation with Martin Terpstra of Plante & Moran PLLC on “Internal Auditor Legal Liability”. March 31 – April 2, 2014, Business Ethics Conference for Deans of Catholic Schools of Business, Co-Sponsored by The Center for Faith and Culture, the Center for Business Ethics and the Cameron School of Business, University of St. Thomas-Houston. I will be leading breakout discussions. March 23-24, 2014, I’ve been asked again to be a preliminary judge for the Gerald Loeb Awards for Distinguished Business and Financial Journalism. ( I am a two-time award finalist.) UCLA, Los Angeles, CA. March 11, 2014, Private briefing via webcast to law firm Cooley LLP private company practice and clients on the AgFeed fraud and my writing, in particular, on Milton Webster, Audit Committee Whistleblower. March 3-4, 2014, NEIU European Business Conference, Chicago, IL, Speaking on “The Challenge of Creating and Sustaining A Multinational Career”. My presentation. February 10, 2014, Stanford University Graduate School of Business, Class visit to Bus F332/Law 725 Finance and Society taught by Professor Anat Admati, author of the new book Bankers’ New Clothes. A post with my lecture notes. December 5, 2013, Baruch College of the City University of New York, Ensuring Integrity: The 8th Annual Audit Conference, I’m on a panel with Professor Robert Coulson of Baruch College, Brian Croteau of the SEC, Greg Jonas, Director of Research and Analysis at the PCAOB, and Phil Wedemeyer a Director at Atwood Oceanics. We talked about the PCAOB’s audit quality indicators initiative. Here’s an article written about that panel in Corporate Responsibility Magazine. November 13-14, 2013, PCAOB Standing Advisory Group meeting, attending and covering. November 7-8, 2013, Visiting students and faculty at Michigan State University at the invitation of auditing Professor Chris Hogan. November 5-6, 2013, Futures Industry Association Expo 2013, Chicago, IL, attending and covering. November 1, 2013, Spoke at University of Chicago Law School for a class taught by Tom Manning on corporate governance in China. October 17, 2013, Women In Listed Derivatives (WILD) Chicago 2nd Annual Symposium and Networking Reception, Federal Reserve Bank of Chicago, 4pm. Panelist. October 9-11, 2013, The Professional Liability Defense Federation (PLDF) Annual Meeting, special guest luncheon speaker on the 10th, “Is Private Litigation The Only Hope For The Accounting Profession?” The Westin Hotel, Chicago. September 30, 2013, Live “Spreecast” hosted by Broc Romanek of TheCorporateCounsel.net on the PCAOB’s proposed changes to the auditors report. With Joseph Hall of law firm Davis Polk & Wardell LLP. September 25, 2013, Speaking to graduate students in the College of Communication at DePaul University, Chicago about the importance of finance and accounting proficiency for aspiring business journalists and corporate public relations professionals. Invited by Matt Ragas, an assistant professor of Public Relations at the school. July 22,2013, Marquette University speaking to graduate auditing class at the invitation to Accounting Department Chairman Michael Akers. July 17-19, 2013, July 17 informal meeting with Villanova University accounting faculty. July 18 spoke to Villanova University students and interested faculty at the invitation of Professor Anthony Catanach and an informal visit at the American College, a think-tank, on July 18. Spoke twice at the PICPA Educators Conference in Hershey, PA July 19. Keynote in the morning and lunch speaker. Morning: “The Ethics of Auditor Independence and Our Public Duty”, skepticism and professional responsibility in accounting and auditing. Lunch: “Auditor Independence, Professional Skepticism and Auditors’ Obligations When Fraud Happens: Case Studies and Examples”, building on the morning remarks with actual examples and “war stories”. Here’s a link to that combined presentation. June 29, 2013, RT Television, The Keiser Report appearance. Talking about Anglo Irish, Ernst & Young, and my latest Forbes magazine story, “The Madoff of Munis”. Here’s a link to the video. June 20, 2013, IIA Augusta, GA Chapter. “Internal Auditor Liability: Why You Should Pay Close Attention To The Colonial Bank and Avon Cases”. May 16-18, 2013, Spoke for the fourth year in a row at the Seventh Annual Fraud and Forensic Accounting Education Conference hosted by Georgia Southern University’s Center for Forensic Studies in Accounting and Business and sponsored by Porter Keadle Moore, LLC. JW Marriott Buckhead in Atlanta, GA. Here’s my speech on May 16: “Professional Skepticism and Auditors’ Obligations When Fraud Happens: Case Studies and Examples“. April 24-25, 2013, Texas Tech University Rawls College of Business “Strive For Honor Week”. My presentation was Wednesday, April 24, 2013, 3:30 – 5:00 p.m, Rawls College of Business, Room 101, “The Economic Significance of Accounting and the Key Role of Integrity in the Profession“. Hosted by Professor Robert Ricketts. April 16-17, 2013, Marquette University, Milwaukee Wisconsin, at the invitation of Accounting Department Head Professor Michael Akers and Professor Jodi Gissel. The presentation I gave to a graduate forensic accounting class and an undergraduate audit class was entitled, “Auditor Independence, Professional Skepticism and Fraud”. April 9-11, 2013, Texas A&M University at the invitation of Professor Michael Shaub. Guest taught his Accounting and Ethics class for two days and visited with faculty and Ph.D. candidates. April 8, 2013, IIA Houston Chapter Annual Conference, “Internal Auditor Liability: Why You Should Pay Close Attention To The Colonial Bank and Avon Cases”. March 11, 2013, Interviewed by Broc Romanek on TheCorporateCounsel.net blog, “Francine McKenna on Audit Industry Developments”. March 4-5, 2013, Northeastern Illinois University, Latin America International Business Conference. I planned to present, “The Challenge of Creating and Sustaining A Multinational Career” the evening of the 5th. Canceled due to snowstorm. Ask me to do this presentation at your university or industry conference. February 19, 2013, Market Technicians Association, “Risk 2013: Protecting Your Trading Accounts From Fraud”, DeVry University Chicago Loop Center, 5pm. My remarks are here. Feb 10-12, 2013, Keynoted for the Federation of Schools of Accountancy and the Accounting Program Leaders Group at their annual joint meeting for accounting professors in San Diego, CA. My speech is here. Video of the speech including my ad-hoc remarks and Q&A is here. January 17-19, 2013, Keynoted Saturday morning at the American Accounting Association Auditing Section Midyear Conference, New Orleans, LA. My speech is here. November 26, 2012, Panelist at NYU Stern School, Ross Roundtable on Impact of Reemergence of Consulting Practices at Major Audit Firms, with Paul Volcker and Robert Herz. 4-6pm. Here are my remarks. Here’s a summary of the session by Accounting Today. Here’s a quote from me from the session in Floyd Norris’ column in the New York Times that following Friday. November 21, 2012, I was asked to talk about HP and Autonomy tonight on NPR’s “All Things Considered” program. November 15-16, 2012, Attended the PCAOB Standing Advisory Group Meeting, Washington D.C.
November 14, RT Television, The Keiser Report appearance. Talking about JP Morgan and Jamie Dimon. Here’s a blog post with the link to the video. October 26, 2012, Attending as past-President of ISACA Chicago Chapter, the ISACA-Chicago Chapter, PwC’s Forensic Services Practice and Neal Gerber & Eisenberg LLP hosting a General Counsel Roundtable Forum focusing on the Consumer Financial Protection Bureau (CFPB). Union League Club, Chicago. September 24-26, 2012, Visited North Carolina State University, Raleigh, North Carolina. July 17, 2012, I appeared on Chicago Tonight, a nightly news program produced by WTTW, Channel 11, the public television station in Chicago on, talking about business ethics. July 13, 2012, 66th annual Society of Corporate Secretaries National Conference at JW Marriott Hotel in Washington, DC, Participating in a panel, “Auditors, the Board and Shareholders: An Evolving Relationship.” I was joined by Kayla Gillan of PwC, Guy Jubb of Standard Life, a UK based investment advisor and Marilyn Mooney of Fulbright & Jaworski. The panel was moderated by Ken Bertsch, President of the Society. July 8-11, 2012, Boston, MA, Covered the Institute of Internal Auditors International Conference. June 24-26, 2012, Palo Alto, CA, Attended Stanford Rock Center Directors’ College at Stanford University. June 6, 2012, RT Television, Capital Accounts, I’m interviewed live in the studio in Washington DC on JP Morgan trading loss and MF Global by Lauren Lyster. June 4-6, 2012, Washington, DC, Moderated “SEC Reporting Update” and some other panel discussions at the Compliance Week Annual Conference. May 23-24, 2012, New York City, Attended Stanford Rock Center Program for Journalists: A Primer in Corporate Governance. May 18, 2012, RT Television, Capital Accounts, I’m interviewed on the accounting behind ‘Hot Tech’, Facebook IPO, JP Morgan trading loss and MF Global by Lauren Lyster. May 17, 2012, The Committee for Monetary Research and Education Annual Dinner. My Topic: The Mystery of MF Global: How Hot Money and Hubris Caused The Loss of $1.6 Billion in Customer Funds. Here’s the speech. May 15-17, 2012, Presenting for third year in a row to the Georgia Southern University Fraud and Forensic Accounting Conference, , Savannah, GA. My presentation: Auditors as “Whistleblowers”: The Auditors’ Responsibility to Report Fraud and Illegal Acts. April 29-May 2, 2012, Milken Conference, Los Angeles, CA. Here’s a piece about the incredible lineup of panelists and speakers. March 6-7, 2012, Gust lecturer, Eastern Illinois University. My speech to a large group of students, faculty and visitors in the afternoon was entitled, Who Will Slay The Dragon? Penn State and College Football: How “Ethical” Institutions Have Dropped Their Swords and Shields. The evening presentation to MBAs was, Stay on your feet. How “new hires” can successfully negotiate the slippery ethical slopes of the workplace. February 11, 2012, The Keiser Report, a program presented by Russia Today TV, talking about the MF Global bankruptcy starting at the 13:00 mark. February 6, 2012, Guest lecturer, Columbia University Financial Engineering Practitioners Seminar, New York, NY at the invitation of Professor Emanuel Derman. Topic: “Modeling Fraud: Models Behaving Nefariously”. Here’s the presentation. November 15-16, 2011, Guest lecturer, James Madison University, faculty and student visit at the invitation of Professor Tim Louwers. A speech and Q&A for MS in Accounting students was informal. My speech for the Beta Alpha Psi initiation dinner is here. I appreciate your work, I hope someday they see you as more than a thorn, but rather a voice of reason and transparency. Looking forward to seeing your presentation in Chicago. Hi Francine, Hopefully your practice of bringing truth and transparency to the forefront, will bring about the changes and accountability needed to fix our foreclosure process. We need this to happen to have a true recovery in housing. Keep up the good work!